Rhododendron ponticum was introduced into the UK in 1763 as a cultivated flowering plant by the Victorians due to its attractive flower and robust nature. The plant’s ability to thrive in the UK climate, especially in wooded areas where other species suffered, made it an ideal plant to introduce to the region. Estate owners around the UK planted Rhododendron to provide dense undergrowth to protect game and to improve the aesthetics of areas, with its attractive flowers adding vibrant colour. Early plants were crossed with new species introduced in the 1800s, producing hybrids which are more resilient and have no natural predators to control them. Harsh winters in the late 1800s had a severely detrimental impact to native flora and this allowed the new hybrid resilient Rhododendron to thrive. Why do we need to control Rhododendron? Rhododendron has serious negative impacts on the natural ecology of the UK. The dense leaf canopy leaves native flora is unable to compete with the plant and also kills off grasses. This in turn means major soil erosion occurs during periods of heavy rain, as the natural grasses which would normally help bind soil have not been able to survive. The plant takes at least 10 years to become fully established, but once established it is then capable of producing up to a million seeds per year, which can disperse over large areas. It is an aggressive coloniser and once established can be both difficult and expensive to eradicate. It is crucial to all control efforts to start with a well-outlined management programme. This should establish the extent, age and health of the infestation and allow land owners to decide on the most appropriate treatment program and prioritise the treatment of high risk areas. It is also important to take into consideration what will happen with the land after clearance – a planting programme to help re-establish native grasses and flora may need to be undertaken. As Rhododendron produces viable seeds, on-going monitoring will be needed and germinating new shoots should be removed at the earliest opportunity. The monitoring of treated sites may be needed for a number of years. Stem Injection is the most effective treatment option and our preferred method. A small measured dose of herbicide is injected into a pre-drilled hole in the stem of the plant, causing the plant to die back. The trunks can then be removed and disposed of. Foliar application can be used on juvenile shoots too small to inject and applied by knapsack or spot sprayer. Stump treatment is also very effective and allows the top growth to be removed immediately. The trees are cut a few centimetres from the base and holes are drilled into the cut stump. Specialist plugs containing herbicide are then hammered into the stump which prevents re-growth. Flailing and manual cutting can remove the top growth, but this alone will not eradicate Rhododendron. A suitable herbicide must be applied to prevent re-growth of the plant. 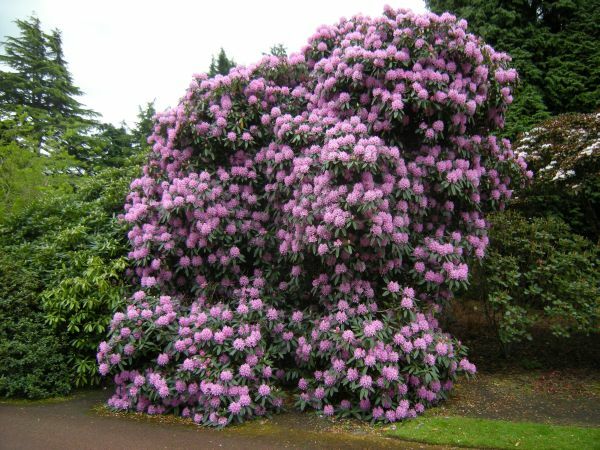 The time taken to eradicate Rhododendron and the cost of treatment varies between individual sites and these are dependent on a large number of factors, including the health of the plant and the size of the infestation. Every site has its own characteristics, and each one should be individually surveyed in order to establish the most suitable treatment option.